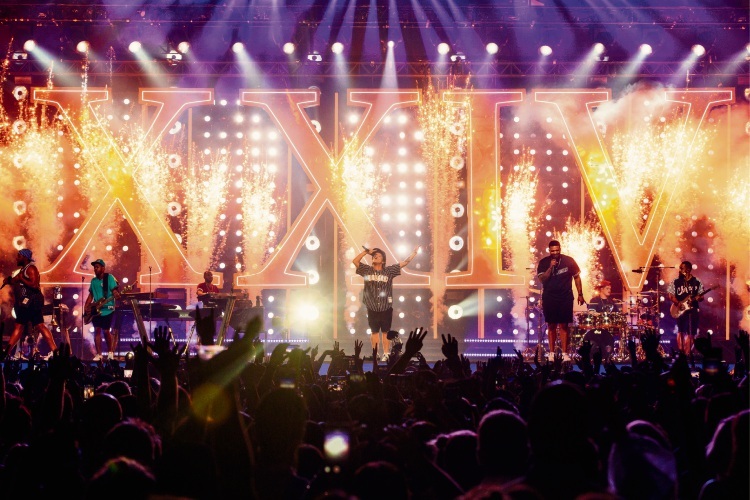 Bruno Mars during his 24K Magic tour in Australia. BRUNO Mars marked the one year anniversary of starting his 24K Magic world tour (it began in Belgium, March 28, 2017) by performing at Perth Arena last night – and with 12 months of “rehearsal” it was little surprise the music superstar delivered a super slick performance. Riding high on the wave of taking home seven wins at this year’s Grammy Awards, including song, record and album of the year, the Honolulu born and raised Mars and his band The Hooligans delivered a show drippin’ in finesse. The evening began with special guest Dua Lipa who showed she had recovered from her well-documented emergency wisdom tooth surgery that saw her miss concerts on the east coast. The growing crowd gave her a warm welcome as she jumped around and strutted the stage in her sneakers while performing songs including Hotter than Hell, Be The One, IDGAF and New Rules. But girls, hit your hallelujah because 24 karat magic was in the air – and no one could get enough when Mars entered the stage and launched into a heart-pounding Finesse and 24K Magic before it was declared “that was just the warm-up”. It was pyrotechnics galore as Mars was too hot (hot damn) with his super cool (Super Bowl halftime show-worthy) moves and although he may be a man of few words between songs, what he lacks in banter (unlike Ed Sheeran, Robbie Williams, James Blunt recently) he makes up for in swagger. He moved around the stage looking confident and relaxed while having a blast with The Hooligans – who are more than just a back up band, acting as dancers, singers and each getting their own solo during the course of the concert. It was a big stage and they filled every part of it. Everyone was on their feet dancing (a demand from Mars) in time for Treasure and Perm before the tempo slowed momentarily for Calling All My Lovelies. The speed picked up again during Chunky and That’s What I Like involving a bit of a gyrate from Mars that sent the crowd wild and continued as he sang his “new song” Aussie, Aussie, Aussie. It stayed slow and smooth with Versace on the Floor before everyone swayed in unison to Marry You and danced along to Runaway Baby. When I Was Your Man called for people to turn on their mobile phone flashlight as Mars demonstrated his vocal capability beautifully. The glitter cannons exploded during Locked Out of Heaven and Just The Way You Are was dedicated to each and everyone in Perth Arena. However the night could not have been over before encore and Uptown Funk raised the roof. Mars will have performed more than 200 concerts by the time the 24K Magic world tour wraps up with four nights in LA in October (he added more North American dates after his Grammy haul). Last night may have been a concert but it felt more like a party and that’s what I like – because Mr Mars you are amazing just the way you are. Mars performs his second sold-out Perth Arena concert tonight.